We have always been big Dino Dan fans here! First, Tater was a big fan of Dino Dan when he was younger, and now, little Bean has filled right in his big brother's footsteps. We have never had the chance to own any of the Dino Dan DVD's, though. Until now, we DVR'd the show,and hoped that no one deleted it before the boys were done watching it. However, now we have a much better way to watch the show! This, my friends, is a brand new Dino Dan Dino 4 Pack 4 DVD Set! It even contains a brand new, never before seen Dino Dan DVD! It contains Ready, Set, Dino!, Dino Trackers, To Catch a Dino, and Cretaceous Creatures. This set is selling for $24.99, which is a great price for such a complete set! I love that all of the DVDs slide into one box, and the boys love that they now have all of their Dino Dan favorite episodes at their fingertips! This would definitely make a spectacular Christmas gift for the dino lovers in your life! I think that all kids, even girls, really get into Dino Dan, because it's really cool for them to see Dan, a regular kid just like them, having all of these amazing dinosaur adventures. What kid doesn't love that?! I know that my kids are always popping off dino facts that they have learned from Dino Dan, and I like that it is a good, wholesome show, with no "bad stuff" to be found. If you do have a huge dino fan in your house, make sure that you also check out the Dino Dan website, where your kids can go on EVEN MORE dino adventures! 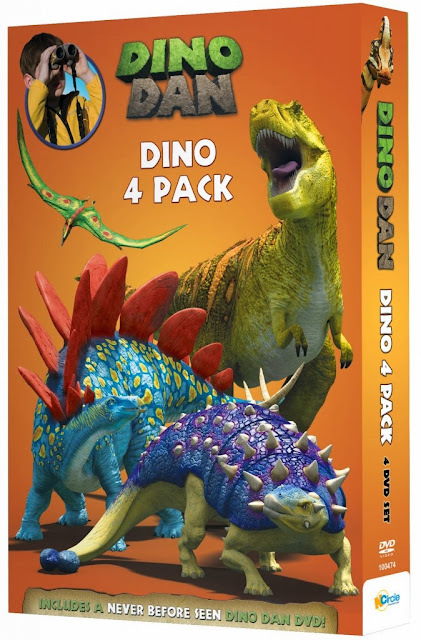 We are also lucky enough to be giving away one Dino Dan 4 Pack set to a lucky Flip Out Mama reader! To enter, simply leave a comment below telling me who you would give this set to if you won! Simple as that! Contest will end on 10/20/13 at approx 10pm EST. Winner will be contacted within 24 hours with instructions on how to claim their prize. Good luck! We received a sample product in exchange for our honest review, all opinions are 100% my own.